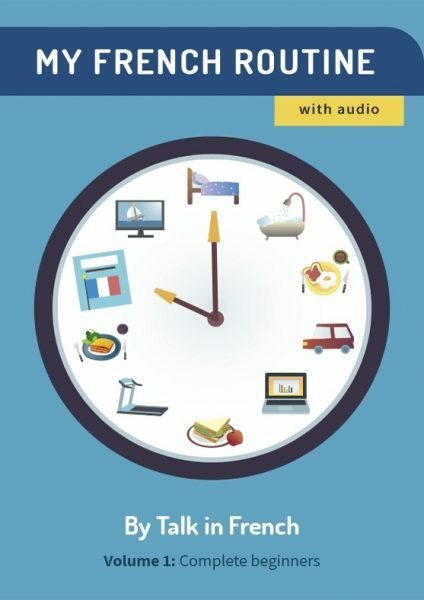 France has so many types of cheese, wine, and specialties from all over the French regions that it’s hard to keep up! Where do you go to try the ratatouille… or the famous frog legs, if you’re feeling adventurous? Don’t fret, I prepared a culinary Tour de France for you to enjoy. I even added the recipes with the brand new region names plus surprises for you to try! Let’s kick off the list with dishes from the North of France. Nord Pas-de-Calais and Picardie is the region that goes up to Belgium, Holland and Germany. The United Kingdom is not very far away, so their cuisine is heavily influenced by this melting pot of flavors. 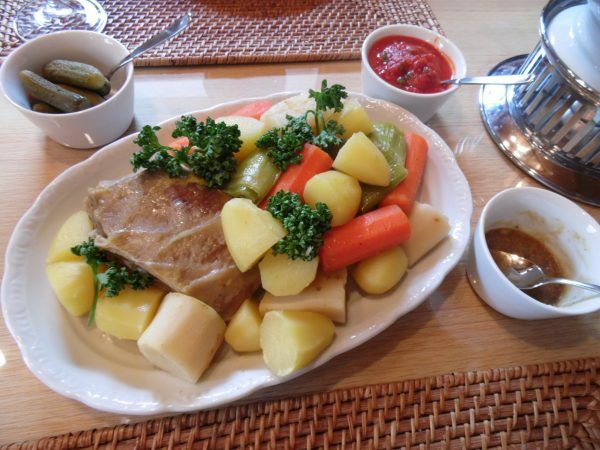 So it’s both sugary and savory here… and everything is cooked in a big pot like in Germany! This dish is all about freshly picked mussels cooked with white wine, herbs and parsley. 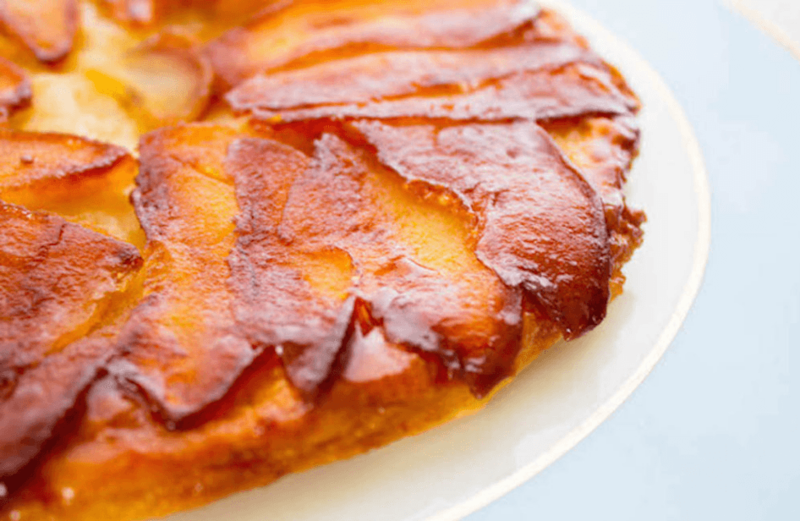 The recipe seems to come from Belgium, but the Breton argue they were the first to cook them! 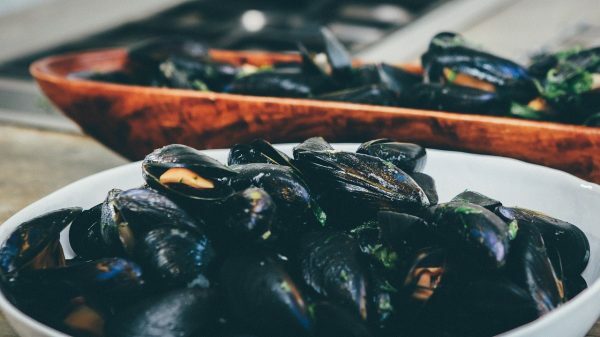 The key to this recipe is to take really really fresh mussels, almost straight from the sea, and there are endless variations of this recipe if you’re fond of mussels. The Great East Region covers the Hauts de France and goes all the way to Germany on the East. Therefore the gastronomy is influenced by the rich German cuisine and really keeps you up through the day in the colder continental climate. If you want to end on a sugary note you can pick up a quetsches tarte bergamotes from Nancy, dragées from Verdun, cherries from Metz, Boulay macaroons, Commercy madeleines and the pink biscuit from Reims(exceptional in the sense that it still holds even dipped in Champagne…), cinnamon, or a kouglof/kugelhof! There are two different spellings according to who you’re talking to. 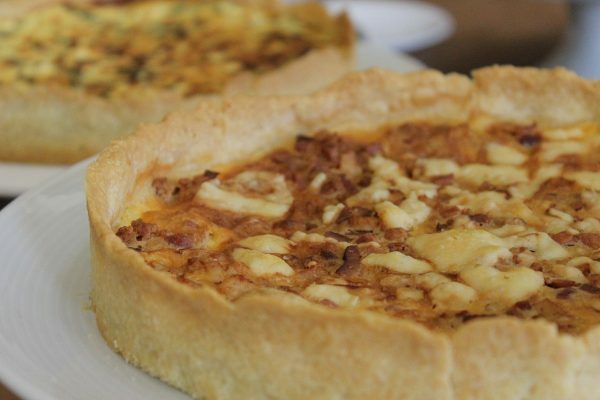 The Quiche Lorraine is a pie made with fresh cream, milk, eggs, nutmeg and grilled bacon. These last ingredients give it a smoky taste. It is so much appreciated everywhere in France that you can find it pretty much everywhere in the country–whether in its traditional versions or in a more modern version with mushrooms, leeks, and chicken. If you are in a Lorraine restaurant, you can also taste Choucroute, a dish made of fermented cabbage and regional charcuterie but if you make it yourself, you’ll have to open the windows after! Burgundy-Franche-Comté is located between the cities of Dijon (famous for its spicy mustard) and Lyon, south of Paris. Between the Christmas tree forests and the mountain villages from Franc-Comté and the world-famous wines from Bourgogne (Burgundy), Burgundy is where the author of the first cooking books in History was born (La Varenne with Le cuisinier Français – The French Cook). Burgundy people like their food spicy, with spicy mustard and smoked lard. The sauces are usually added with onions and are added to stews or ragoûts in French. Vegetables are usually cooked with cream, and where would be Burgundy gastronomy without wine (like Armand Rousseau, Dugat-Py or Romanée-Conti from that region)? cheeses like Comté, Mont D’Or and Morbier (also not for the faint of heart! Snail is one of the few dishes French people get odd looks about. The unique snail recipe with parsley butter is commonly called “escargots à la bourguignonne”. They are presented in their shells and eaten with a small “snail fork” or a toothpick. 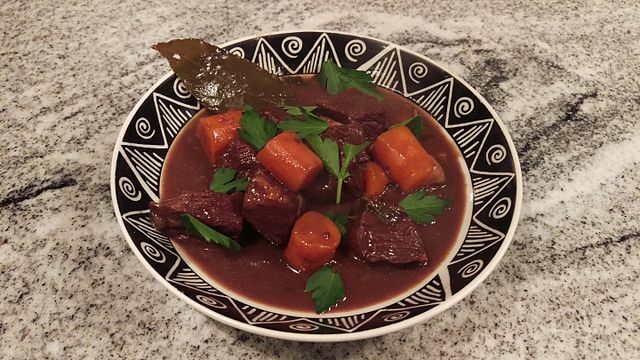 The Boeuf bourguignon takes its name from its two main ingredients, both from Burgundy: beef meat from Charolais and côte de Nuits or côte de Beaune wine. Before being a Sunday dish everywhere in France, beef bourguignon was a favorite of peasants during special holidays. Its slow cooking is done in a stew pan and is accompanied by onions, garlic, bacon and a bouquet garni. Normandy is North of Brittany, and is the region of milk and apples. It’s one of the regions that can provide specialties from appetizers to dessert, without forgetting the cider! Other specialties include cider vinegar, seafood (mussels, oysters and the Seine bay scallops), mushrooms, apples, butter and crème fraiche. And if you can’t remember all of them, the pop band Stone and Charden even made a song about it! An excellent family meal for long winter nights, the Pot-au-Feu is, like the name suggest, a very slowly cooked meat dish (you’ve got to let it simmer for 4 hours and a half!) cooked in a pot. This has to be the French dish that led to the biggest number of variations, having been featured in many different regions. 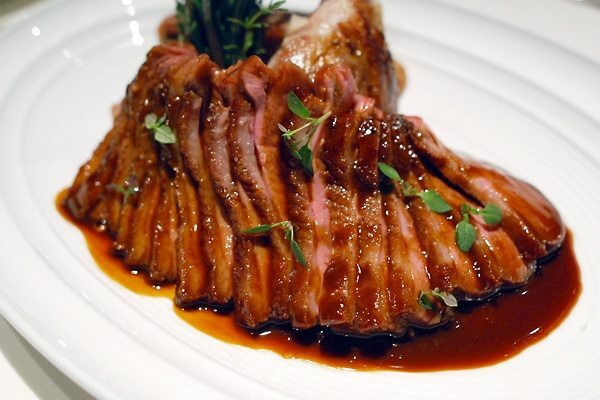 It’s usually composed of a piece of meat cooked slowly, bone marrow, beef tail, and various vegetables and spices. The very important part is to add a bouquet garni to the mix, made with parsley, thyme, bay leaf, garlic and black pepper grains. You can visit Brittany from harbor to harbor and from island to island along the salty coasts. It’s famous today for its standing stones, the menhirs and dolmens in Carnac, the Brocéliande forest where the mythical Arthur King used to roam. The cuisine is also all about cooking with fresh produce and bounties from the sea. 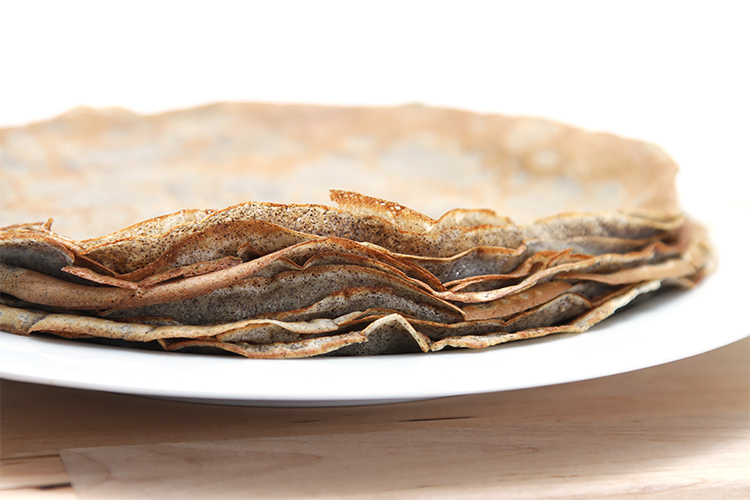 My family has a very old family recipe for crepes that dates back centuries. The secret for delicious sugary crepes is to pick out great ingredients. To avoid lumps, add the milk very slowly and mix energetically—you’ll know that the dough has the right consistency when it coats your finger just right. My grandma’s secret is to add some alcohol, like rum, cognac, Grand Marnier or Calvados: it evaporates on the pan and gives the crepes an amazing flavor. Gastronomy in Pays-de-Loire reflects its geography, between the ancient marine harbors and the heart of the regions. It has Guérance and its “white gold”, the Lu Petit Beurre from Nantes, Sarthe and its rillettes and poultry from Loué. The Parisian region is not only about Paris, there is also the Versailles castle, the Marne banks and their guinguettes, the races in Chantilly, Provins and its medieval city. To finish a meal you can eat a Paris-Brest or a Saint-Honoré. It’s the King of hot sandwiches! 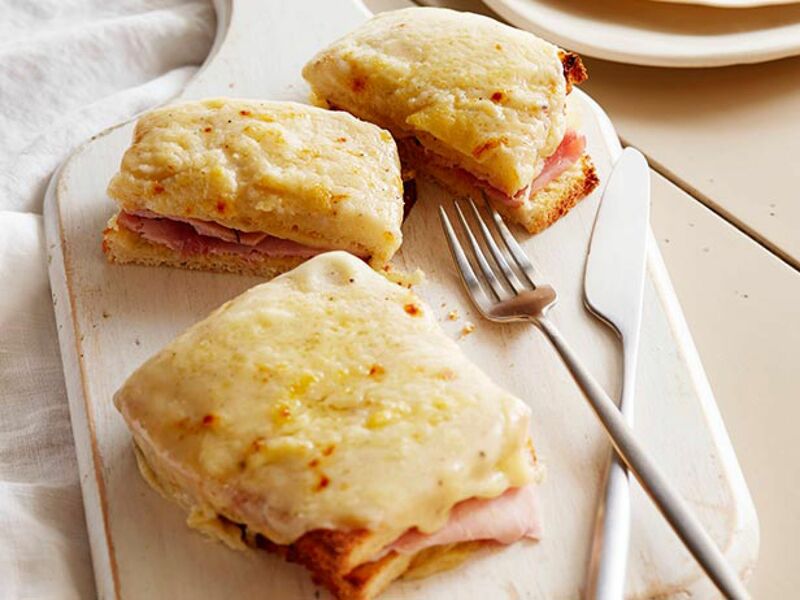 As delicious as it is easy to make, the Croque-Monsieur, allegedly appeared for the first time in a Parisian bistro on boulevard des Capucines. It’s that simple, almost trivial composition of jam, Emmental cheese and sandwich bread that made that express snack at a cheap price such a hit. For the gourmets, you also have the version with a sunny side up egg on top called the Croque-Madame! The Hachis Parmentier was named in honour or Antoine-Augustin Parmentier, who popularized the pomme de terre and helped France get rid of famine. This dish first appeared in the bistros of the capital. It is composed of two layers: the first is minced meat to which the chef adds aromatics, the second layer is a homemade puree, with grated cheese on top. The New Aquitaine Region forms a huge territory from La Rochelle all the way to Spain! Apart from its world reputation for the Bordeaux wine, this region is also famous for its foie gras, meat from Limousin, milk as well as seafood products. leeks and potatoes from Ile de Ré, butter, Chabichou cheese, Cognac, purple mustard, red fruit, Périgord apple. 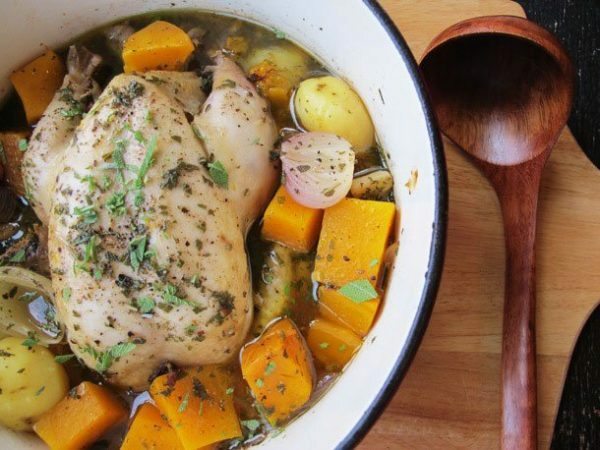 Aquitaine is where King Henry the IVth was from: he’s the one who famously introduced the Poule au pot recipe to the French people. He was very keen on taking care of his subjects, and famously said he wanted “each of the inhabitants of his kingdom to be able to cook a Poule au Pot every Sunday”. The Basque Country is technically not a French region but its Northern part is still part of Aquitaine. It’s famously known for its cuisine, thanks to its quality and refinement. This region has one of the richest French territory in terms of gastronomy, with influences from both the Béarn and Gascon country on the northern side and Spanish influences (like the use of olive oil) on the southern side. If you had to choose only one from this region, it would have to be the Poulet Basquaise. The poultry is raised locally and these are specially rare breeds of chicken and duck in the Basque country. 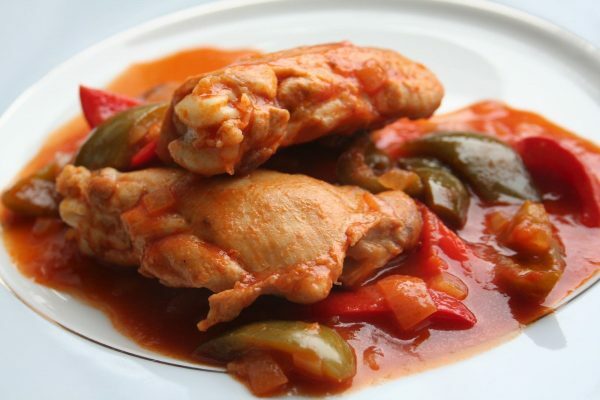 The Poulet Basquaise is a complete dish where the meat is tenderized and softened with a piperade, a sauce composed of Bayonne ham, peppers, tomatoes and Espelette pepper. The Center of France is all about pleasures for the eyes and also for the palate. It’s nicknamed “the country with the thousand ponds” and has also cereal plains, forests, lands to have cattle and the Loire banks where many fish swim. The Orléans people are well known for having a strong appetite: they’re well known for liking both appetizers and desserts, and are made famous for their pies or patés en croûte.They also have something for the sweet tooth, not limited to the Tarte Tatin, like the forestines from Bourges, praslines from Montargis. The name comes from the Tatin Sisters (Stéphanie and Caroline) who had an Hôtel Tatin in Lamotte-Beuvron (still open today! ): it’s a perfect example of serendipity. The sisters had lots of hunters as clients, and one day on opening season, Stéphanie was overworked and put apples in the oven directly, forgetting the dough. Later, realizing her mistake, she added the dough on top of the preparation and served the upside-down pastry as such. It was very much appreciated by the hunters and that’s how we’ve got this caramelized delicious treat today! The Occitanie region opens both to the Pyrénées and to the Mediterranean sea, and is known for their inhabitants liking good foods. It has so many legendary recipes and specialties, between the garbure (ham and vegetable stew), the Bayonne ham, the salmis de palombe, numerous goat and cow cheeses, the Irouléguy and Madiran wines, the pommes soufflées (fried puffed potatoes), and the worldly famous sauce au beurre blanc, Béchamel and Béarnaise sauce. With the ferias traditions and the Camargue country and its beautiful bulls, the Occitanie people surely know how to party! Cassoulet is not the lightest dish you’ll eat in France! Originally from Languedoc-Roussillon, the legend places the origins of the cassoulet in the city of Castelnaudary which was besieged by the English during the Hundred Years’ War. According to the story, the hungry castle dwellers had gathered all the available food (white beans and different meats) to make a huge ragout or estofat, to reinvigorate the soldiers. They were able to beat the English and free the city. That legend comforted the nationalist sentiment and makes cassoulet a beacon of French values of courage and tenacity! 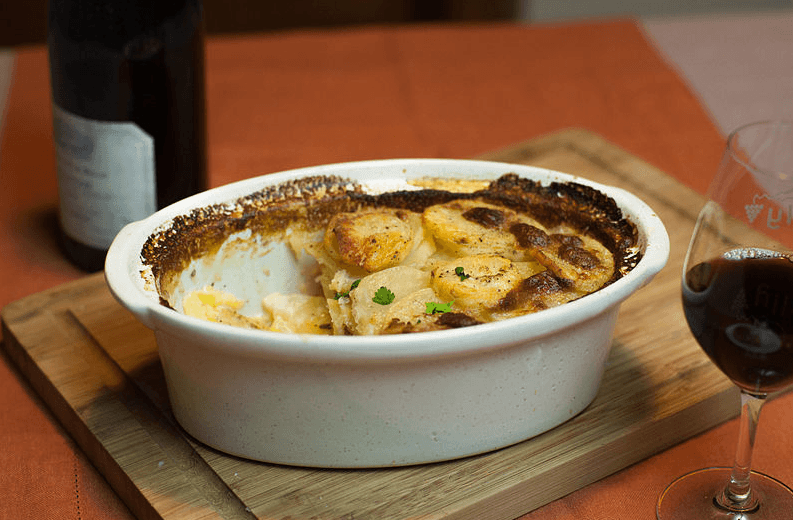 In the Grenoble region, another winter dish has become a mainstay: Gratin dauphinois. On July 1788, the municipal officers of the Gap city tasted a dish unknown until then. It was gifted by the general lieutenant of Dauphiné and was called potatoes à la dauphinoise. The sliced potatoes are cooked in the oven with garlic, crème fraîche or milk and nutmeg. No cheese is added in the original recipe but it is so delicious that everyone likes to cook it in his own way. Auvergne is France’s “Green Lung” and has a typical rich and copious cuisine, despite its reputation. Auvergne people will serve you their Petit salé aux lentilles (that my grandma used to make even if I wasn’t a fan of lentils growing up) stuffed cabbage. In the mountain region of the Alps, they stock up on cheese. Inspired by their Swiss neighbors, they have loads of cheese specialties. But it’s also the Lyon region, one of the huge gastronomic cities in France with its traditional charcuteries, and its Beaujolais Nouveau wine you can appreciate with local specialties in the many bouchons lyonnais. There is even a party every year, everywhere in France, to celebrate the New Beaujeaulais coming out! The Savoyards regularly consume raclettes and fondues. For the raclette, the guests have small bowls that each one fills as he wishes with raclette cheese (from co-operatives farms, if you are in the mountains) and quail eggs that you scrape with a wood raclette (hence the name). Delicatessen and boiled potatoes are available next to the melted golden cheese. 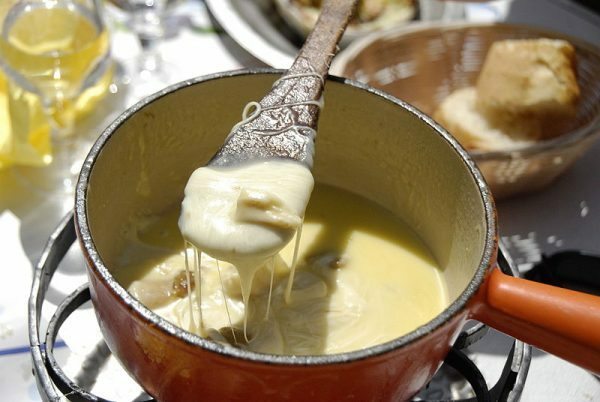 The Fondue Savoyarde, is a large container filled with a mixture of 3 cheeses and white wine. The guests then plunge small bits of bread impaled on sticks. Tradition has it that the one who makes his piece of bread fall has to pay a forfeit, so keep your eyes on the prize! The gourmet “PACA” will delight you with savors to enjoy in the olive trees shade, away from the Mistral and Tramontane winds. Over there, everything smells good: the génépi, from which you make an excellent liqueur, the fruits and vegetables from the open air markets, or the aromatic herbs like thyme, rosemary and completing dishes made with Camargue bull or Mérinos sheep. We’re in the country of Escoffier, “King of cooks and Cook for kings” who invented the Pêche melba dessert (a personal favorite and so easy to make!). You can start with an anchoïde, carry on with a baked pasta gratin with spinach or a Niçoise salad if it’s too hot. Their specialties are basil, garlic, olive and olive oil, aromatic plants, anchovies, capers, tomato, fruit, and Provence wines. 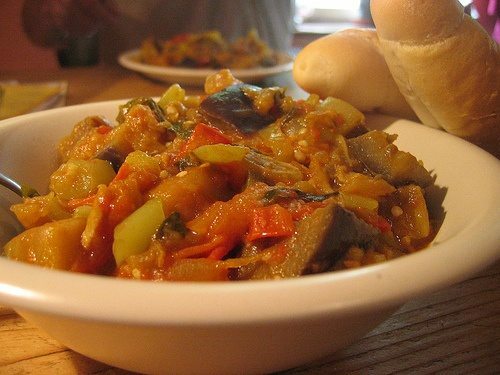 In Provence, it’s a granny’s dish par excellence, and indeed my Nice grandmother makes the best ratatouille. It is so delicious that today most restaurants offer it as an accompaniment to fish or meat… And it’s of course worldly known for its Pixar fame! When you think about the fully-bodied Bouillabaisse soup, you immediately think about the South of France, beautiful weather and eating by the sea, and more precisely to Marseille where it’s a specialty. From the 7th century, when the city was founded, the name of this dish means in Provence occitan “To reduce the boil”. Since there are so many fishermen in that zone, this dish is therefore made up of varied fish, shellfish, tomatoes, spices from the South, mustard and egg yolks. It is eaten with bread or potatoes. You serve it in two times, first the soup, then the fish. This sea dish is enjoyed best with a rosé wine from Provence, of course. Of course, you go to Corsica because of the superb beaches, the cute villages and the mountains…and of course, the gastronomy. Corsica also grows wonderful fruits all year round: citrus in Winter, orchard fruit in Summer (peaches, apricots, plums), figs in Fall. This results to great jams that they make each and every month. Corsica has loads of fish dishes but also mountain ones. 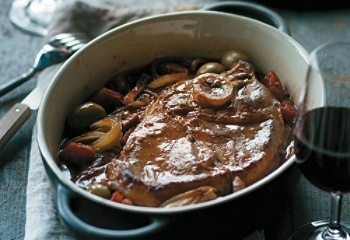 This veal dish uses the Corsican olives that are so typical of this sunny country. There is also the winter Figatellu lentils dish that’s perfect after a hike in the mountain to reinvigorate you ! Talking about islands, France also has territories and departments called the DOM-TOM – Territoires d’Outre-Mer. Between Guadeloupe, Martinique, Réunion, French Guyana and French Polynesia, there are so many occasions to taste some exotic dished as well ! 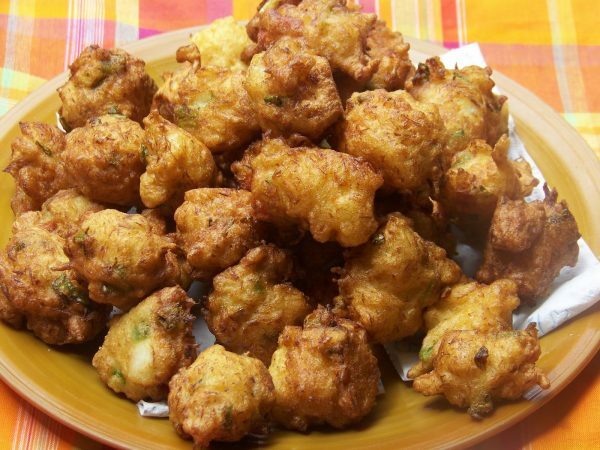 You can start a meal with a traditional Rum punch, the accras preceding the fish creole soup or the creole boudin. The specialties are cane sugar, spices and Cayenne pepper from Guyana, Bourbon vanilla from Réunion, fish and seafood, creole fruit, and Rum, that can also be «arranged » by adding spices and fruit. The Antilles and Outre-Mer islands are all quite different and only have in common the tropical climate. Go and check their gastronomy for yourselves, these islands have so much influence from other surrounding countries that their dishes are very cosmopolitan… But a constant in all of them seems to be spice and hot pepper ! 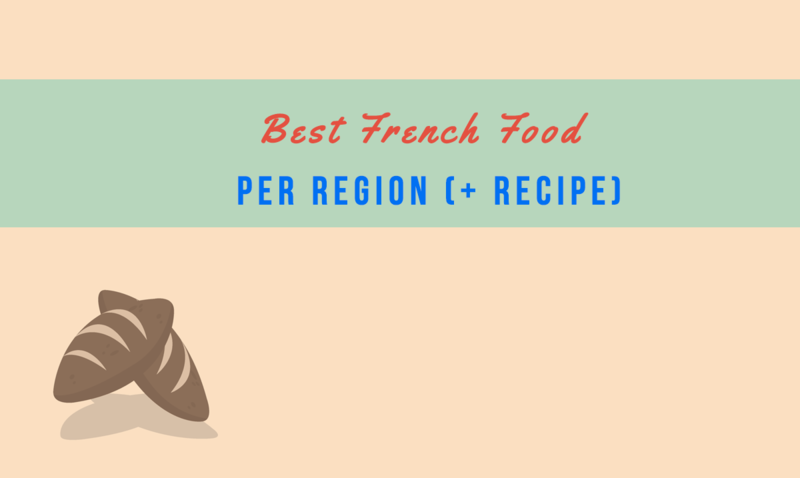 So we’ve been exploring some dishes that are typical of each and everyone of the French Regions. But some of the well-loved dishes plates that are served every day in French restaurants don’t really belong to any region in particular since they’ve become so incredibly popular. Foie Gras, the world associates this specialty with France (although the geese and duck stuffing tradition dates back to antiquity). Best on a brioche bread with a little onion confit or fig jam. Cheese soufflé is quite complicated to realize (depending on the cooking time and the temperature of the oven). Try it only if you’re feeling brave! The true Tartar steak is cut with a knife, then spices and an egg are added. Served with chips, this is a good alternative to traditional steak-frites. Coq au Vin‘s origin is unsure, since Alsace, Burgundy, Champagne and Auvergne all claim it as their own. According to legend, an Arverne people besieged by the Romans sent a rooster, symbol of courage and determination, to the enemy to taunt him. Julius Caesar invited the Arverne chef to diner and the chef was ordered to prepare the gaul rooster in order to impress the Arverne chief! At the time, wine was a luxury product and symbol for abundance and power. And finally, we couldn’t end that article without mentioning a dish that often frighten tourists in France: Frog Legs. Usually fried with a little onion and garlic butter, à la provençale or fricasséed, they are the French elite’s meals served to guests since the XVIth century. We’re still the biggest eaters with 400 tons imported each year. Don’t worry, the taste is delicate and tastes like poultry while still remaining soft.